3D cameras, 4K graphics and biometric log-ins are some of the capabilities that Intel's fifth-generation Core chips will bring to new laptops later this month. The systems will also be thinner, faster and offer longer battery life. But while the chips, based on Intel's Broadwell architecture, offer attractive features, the decision about whether to buy a new laptop will ultimately come down to need. If you want longer battery life or improved graphics, a laptop with a new Core chip is worth considering. But if you mostly use productivity applications like Word and Excel, the new laptops won't provide much more bang for your buck. The new Core chips (code-named Broadwell U) will be an upgrade to Intel's existing fourth-generation Core chips, code-named Haswell. Due to a delay in shipping, the new chips are expected to have a shorter-than-expected life as Intel aggressively pushes Broadwell's successor, Skylake, which will bring wire-free computing capabilities to laptops in the second half of the year. But if you really want a new laptop, here are 10 things about Broadwell U to keep in mind. -- Battery life gets a boost: Dell is promising 15 hours of battery life for its new XPS 13 laptop thanks to a denser battery, while Lenovo's ThinkPad X250 can deliver 20 hours of run time with two batteries. The processors, made with Intel's new 14-nanometer manufacturing technology, consume less power when running applications and graphics. Intel estimates that Broadwell laptops will provide an extra hour of battery life versus comparable Haswell systems. -- 4K video without an external graphics card: Some fifth-generation Intel Core processors support Iris Pro graphics, which will be able to decode H.265 and VP9 format videos at a 4K resolution of 3840 x 2160 pixels. Users will be able to watch 4K video without requiring an external graphics card. Enthusiasts looking for the best gaming experience may still need an external graphics card as the power-constrained chips may not cope with the processing load that usually comes with fast moving images and refresh rates. -- Disappointing application performance gains: The speed boost for productivity applications like Word and Excel in the new Core chips is up by only 4 percent when compared to Haswell chips. That's lower than expected, as Intel's CPU performance usually improves by between 10 percent to 30 percent with each new processor architecture. There's no need to pay a premium or upgrade to Broadwell laptops if you just want to make spreadsheets run faster. An older laptop with a fourth-generation Core chip based on Haswell will be just fine to run productivity applications. -- Chromebooks will get Broadwell too: The new chips are for Windows and Chromebooks. Expect the first Chromebooks with fifth-generation Core and Celeron chips to become available in February. Intel is finding a way for its chips to work with more operating systems, especially with Microsoft's Windows losing ground to Google's Android and Chrome. Most Chromebook applications require an Internet connection, thus diminishing the need for high-performance chips like Broadwell as a lot of processing happens in the cloud. But Google claims more Chrome applications are now working offline, and faster chips help speed up laptops. -- No tablets for Broadwell U: Tablets like Microsoft's Surface Pro 3 are equipped with full-blown Core i chips based on Haswell. But the likelihood of such tablets getting Broadwell-based Core i chips is low. Tablets usually have chips that draw less than 10 watts of power, and the new Core i chips consume 15 watts of power and more, making them unsuitable for tablets. The Core i chips are for laptops and hybrids, and Intel has configured another chip called Core M -- which draws between 4.5 watts and 10 watts -- for tablets. -- Skylake is looming: Intel is trying to lower the curtain on Broadwell's troubled past and is promoting its successor, code-named Skylake, which will bring significant performance gains and a richer user experience to laptops in the second half of the year. Skylake is important for bringing a "wire-free" experience to laptops, with wireless technology replacing display, charging and data transfer cables. Chip shipment delays have led PC makers to bypass Broadwell on some laptops and instead wait for Skylake, which Intel has dubbed its most important processor architecture in a decade. If you are looking to upgrade to a wire-free laptop experience, skip Broadwell and upgrade to laptops with Skylake chips in the future. -- Quad-core Broadwell chips coming next year: Intel is initially only shipping dual-core Core i3, i5 and i7 Broadwell U chips, and quad-core chips code-named Broadwell H will ship later this year. The quad-core chips will have Iris Pro graphics cores, which are packed with the latest technologies such as 4K video encoding and decoding. 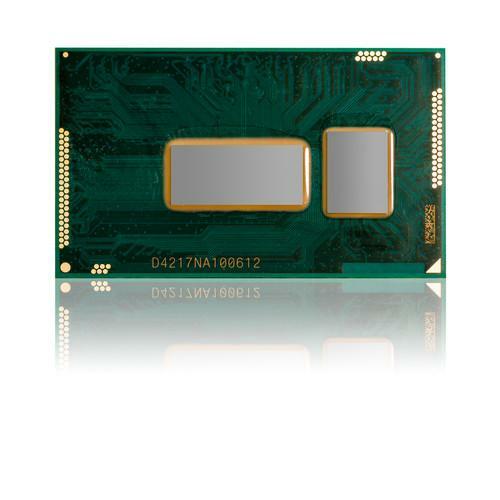 Broadwell H chips will be Intel's fastest performing laptop processors. -- 3D cameras and natural interaction: Desktops are becoming more fun by offering interaction through touch, voice, gestures and sound. Broadwell will be a springboard to bring such interactive features to laptops, many of which will be possible with Intel's RealSense 3D depth-sensing camera. Much like human eyes, the camera can recognize objects and determine distances between items. It can also make Skype chats fun by removing background images and superimposing custom graphics, which could be useful when chatting from a cafe or an airport. The camera can also determine the shape and contours of objects, and scan 3D models for 3D printing. Intel hopes the 3D camera will even recognize human moods and reading habits, though that's wishful thinking at this point. -- Don't remember passwords: Intel wants to trash the need to remember passwords in Broadwell-based PCs, though the company hasn't elaborated on plans. One possible plan involves downloadable McAfee software that will use biometric authentication like face and fingerprint recognition to log users in to Windows PCs, online e-mail or bank accounts. Intel is building security layers into its Core chips that work with McAfee software. -- Business features: Intel later this month will detail new Core chips that support vPro technology, which makes security and remote management of PCs easier. For example, system administrators will be able to remotely disable or wipe out data in case a laptop is stolen. VPro also allows remote troubleshooting of laptops. Core chips with vPro will be targeted at businesses.